Originally signed by the Chicago Cubs as a non-drafted free agent on May 2, 2011...Signed by Jose Serra and Carlos Reyes. Spent essentially the entire season with Class A-Advanced Myrtle Beach, and made one appearance for Double-A Tennessee...Went 6-1 with 10 saves and a 1.81 ERA (13 ER/64.2 IP) in 44 appearances with the Myrtle Beach Pelicans...Led the team in appearances and ranked third in strikeouts (83)…His 44 games ranked second in the Carolina League...Set single-season career-highs in appearances (45), strikeouts (87), and innings pitched (66.2)...Limited right-handers to a .146 average (22-for-151) with 56 strikeouts against just 11 walks...Allowed just one earned run in the month of June, posting an ERA of 0.69 (13.1 IP)...Held opponents scoreless in 33 of his 45 appearances …Limited opponents to one-or-fewer runs in 42 appearances...Worked 2.0-or-more innings in 17 games...Promoted to Double-A on 8/11 and appeared in one game for the Smokies...Worked 2.0 scoreless innings for Tennessee on 8/14 at Biloxi (1 H, 1 BB, 4 K)...Appeared in six games for the Mesa Solar Sox in the Arizona Fall League…Recorded two saves and posted a 1.42 ERA (1 ER/6.1 IP)…Allowed three hits and no walks with eight strikeouts...Acquired by the Orioles on 12/14 in the Rule 5 Draft. 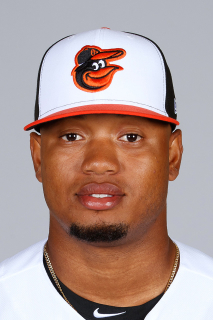 April 8, 2019 RHP Pedro Araujo assigned to Bowie Baysox from Norfolk Tides. April 5, 2019 Baltimore Orioles sent RHP Pedro Araujo outright to Norfolk Tides. April 3, 2019 Baltimore Orioles designated RHP Pedro Araujo for assignment. November 13, 2018 Aguilas Cibaenas placed RHP Pedro Araujo on the reserve list. November 2, 2018 Baltimore Orioles activated RHP Pedro Araujo from the 60-day injured list. October 15, 2018 RHP Pedro Araujo assigned to Aguilas Cibaenas. September 11, 2018 Baltimore Orioles transferred RHP Pedro Araujo from the 10-day disabled list to the 60-day disabled list. Right elbow sprain. June 11, 2018 Baltimore Orioles placed RHP Pedro Araujo on the 10-day disabled list. Right elbow sprain. December 14, 2017 Baltimore Orioles claimed RHP Pedro Araujo off waivers from Myrtle Beach Pelicans. August 18, 2017 RHP Pedro Araujo assigned to Myrtle Beach Pelicans from Iowa Cubs. August 17, 2017 RHP Pedro Araujo assigned to Iowa Cubs from Tennessee Smokies. August 11, 2017 RHP Pedro Araujo assigned to Tennessee Smokies from Myrtle Beach Pelicans. May 12, 2017 Myrtle Beach Pelicans activated RHP Pedro Araujo from the 7-day disabled list. May 5, 2017 Myrtle Beach Pelicans placed RHP Pedro Araujo on the 7-day disabled list retroactive to May 3, 2017. April 4, 2017 RHP Pedro Araujo assigned to Myrtle Beach Pelicans from South Bend Cubs. October 20, 2016 RHP Pedro Araujo assigned to Aguilas Cibaenas. August 12, 2016 RHP Pedro Araujo assigned to South Bend Cubs from Myrtle Beach Pelicans. June 30, 2016 RHP Pedro Araujo assigned to Myrtle Beach Pelicans from South Bend Cubs. May 27, 2016 RHP Pedro Araujo assigned to South Bend Cubs from Eugene Emeralds. June 17, 2015 RHP Pedro Araujo assigned to Eugene Emeralds from AZL Cubs. June 24, 2014 AZL Cubs activated RHP Pedro Araujo. June 21, 2014 RHP Pedro Araujo assigned to AZL Cubs from DSL Cubs. May 31, 2013 RHP Pedro Araujo assigned to DSL Cubs from DSL Cubs2. May 31, 2011 Pedro Araujo assigned to DSL Cubs1 from Chicago Cubs. May 31, 2011 Pedro Araujo assigned to DSL Cubs2. May 30, 2011 Chicago Cubs signed RHP Pedro Araujo.